Everyone has heard of Meatless Mondays. If you were annoyed when the cafeteria at your place of work struck meat from the menu one day per week, well... prepare to feel really ticked off. Now, Your Daily Thread has teamed up with Chelsea Green Publishing to sponsor Meatless in May, a movement that encourages people to cut meat out of their diets for a whole month. I use italics in the above paragraph without the slightest hint of irony. I know it's difficult for a lot of people to imagine not consuming meat every day. A lot of people really enjoy eating meat. It's kind of like me and peanut butter toast. I eat two pieces of it almost every day, and a week ago I would have thought I could never give it up. But then I ran out of peanut butter and I was too lazy to go buy some more, so I had cinnamon and sugar on my toast instead. I liked it so much that I ate it the next day, too, and I still haven't bought more peanut butter. You might say to yourself, "Well, Meghan, since you're already meatless, why don't you give up peanut butter for the month of May?" My answer would be that "Peanut Butter-less in May" just doesn't have the same ring to it as "Meatless in May." It's all in the alliteration. So let's just wait until we get to a month that begins with "P," and then I'll give up peanut butter. Flawed logic aside, there are quite a few compelling reasons to cut meat out of our diets, at least for a little while. Your Daily Thread and Chelsea Green Publishing are mostly concerned about the environment. Livestock farming uses up a ton of the earth's arable land, wastes water, and emits a shocking amount of greenhouse gasses. Tracy and Lauren explain further in this little video. If you're intrigued, watch it for some scary statistics that might convince you to try going meatless. If you're skeptical, watch it because Tracy and Lauren are two very attractive ladies. 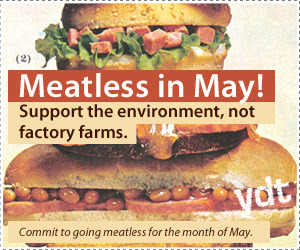 You might think it's too late to be Meatless in May, since it's already May 5th. Consider this: "Meatless in Most of May" packs even more alliterative punch. Just finish eating meat with a bang - maybe with an intense taco-eating contest to celebrate Cindo de Mayo - and then pledge to be meatless for the rest of the month. And now I must cut this blog post short, because today is Cinco de Mayo and margaritas are vegan. make sure your margaritas dont have eggwhites in the foam!!!! I LOVE YOU MEGHAN JOYCE! xoxoxoxo heart. Love looove this post. You're awesome-sauce. Let me know when you're in town again cuz I wanna hang out!